Lewis Hamilton. Yes, the 31-year-old British Formula One rider won the Abu Dhabi Grand Prix race last Sunday. It was his fourth straight pole-to-win triumph (including Texas, Mexico City and Sao Paulo) and he amassed 10 victories this 2016. So, Lewis Hamilton is the champion, right? Wrong. To me, he’s a selfish, me-alone person who’s engrossed only with himself. Here’s the story: Nico Rosberg and Hamilton are teammates in the Mercedes AMG Petronas F1 team. In the March 20 until November 27 season, there are 11 Formula One teams. How many members are allowed per squad? Only two. And these teammates are expected to be friends, partners and should collaborate, right? No. 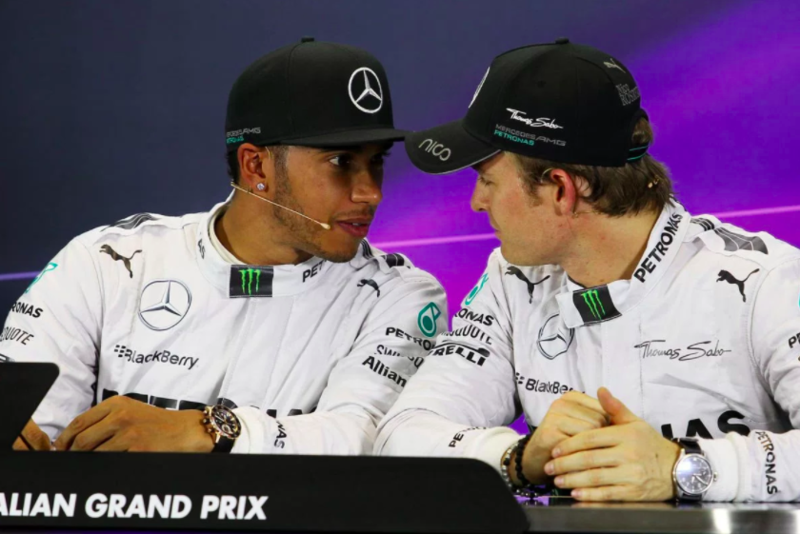 In fact, if you secretly ask Lewis who he despises the most, chances are he’ll whisper the name of someone who’s just five months younger than him and someone with whome he’s raced with in go-karting since they were teenagers. That’s Nico. On paper, Hamilton and Rosberg are allies under Mercedes; in reality, they’re villains. The 2016 Formula One season has 21 races. Entering the last event in Abu Dhabi, Rosberg was leading his teammate by a measly 12 points. The only way for Hamilton to win this third consecutive F1 World Champion title was to finish first (and get 25 points) and for Rosberg to finish in fourth place or worse. I don’t have space to elaborate on the blow-by-blow drama that I saw on TV two nights ago but here’s the summary: Towards the end, Hamilton purposely slowed down not because he wanted the second-place running Rosberg to overtake him, but to draw Seb Vettel, Max Verstappen and the others closer with the hope that they’d overtake Rosberg so he’ll drop to fourth place. It wasn’t meant to be. Rosberg, criticized in the past for being a perennial runner-up to Hamilton and for succumbing to pressure and losing, placed 2nd. In the end, Hamilton won the fight but Rosberg won the war. “It was a tricky situation at the end with Lewis playing dirty tricks,” Vettel said over the radio as he finished third. During the race, Hamilton was repeatedly instructed to speed up. Instead, he slowed down to defy team orders — including a final-lap dilly-dallying move where he was 9-seconds-slower (than his pole lap). And the ultra-competitive 3-time world champ that he is, losing does not run in Hamilton’s blood-thirsty veins. And this is F1, a venue that has witnessed countless dirty antics played since its first season in 1950. Still, what an act of defiance. Even the Mercedes chief Toto Wolff was disappointed. Hamiton’s actions were ugly. Yet, despite his colleague’s self-centered actions, what did the new 2016 world champ say after? “You can understand the team’s perspective, and you can understand Lewis’s perspective — so that’s it,” Rosberg said, ending the controversy and refusing to say bad things about Hamilton. What a classy act, Nico. Reminds me of someone who watched live the Abu Dhabi race last Sunday.